Former Skyline High star Jake Heaps has signed with the Seahawks as a free agent and will attend the team's rookie mini-camp this weekend. The unexpectedly winding road traveled by one-time Washington prep phenom quarterback Jake Heaps since he left Skyline High has finally come full circle. Hoping for one more chance to prove himself in the NFL, Heaps got it Monday with his hometown team, signing a free agent deal with the Seahawks. He will debut with the Seahawks this week when he participates in the team’s rookie mini-camp Friday-Sunday. Heaps led Skyline High to state titles in 2008 and 2009, in the process becoming one of the most-heralded recruits in Washington history, named as a USA Today All-American, among numerous honors (here’s a Jayson Jenks profile of Heaps detailing his high school and college road from 2015). But his college career never took off the way the lofty recruiting rankings and loads of press clippings indicated it would. The 6-1, 208-pounder signed with BYU after also seriously considering Washington. But after a promising freshman season capped by throwing four touchdowns in a New Mexico Bowl game win over UTEP, Heaps’ career veered off-course. Unable to hold on to the starting job, he transferred after the 2011 season to Kansas. Unable to lock down the full-time starting job in two years at Kansas, Heaps transferred again, ending up at Miami. In his final college season with the Hurricanes he threw just 12 passes, completing six. His final college stat read line 497 completions in 908 attempts for 5,233 yards with 32 touchdowns and 27 interceptions. After going undrafted in 2015, he got an invite to the New York Jets’ rookie mini-camp, and after a solid showing was signed to a contract. He was with the Jets through training camp, playing in two games and throwing just one pass, which went incomplete, until being released on Aug. 27. Since then, Heaps has dabbled in coaching while striving to keep his career alive. He also spent some time last fall with the Brooklyn Bolts of the Fall Experimental Football League. Heaps has thrown at least three times for the Seahawks in the past year and then also threw at UW’s Pro Day in March. 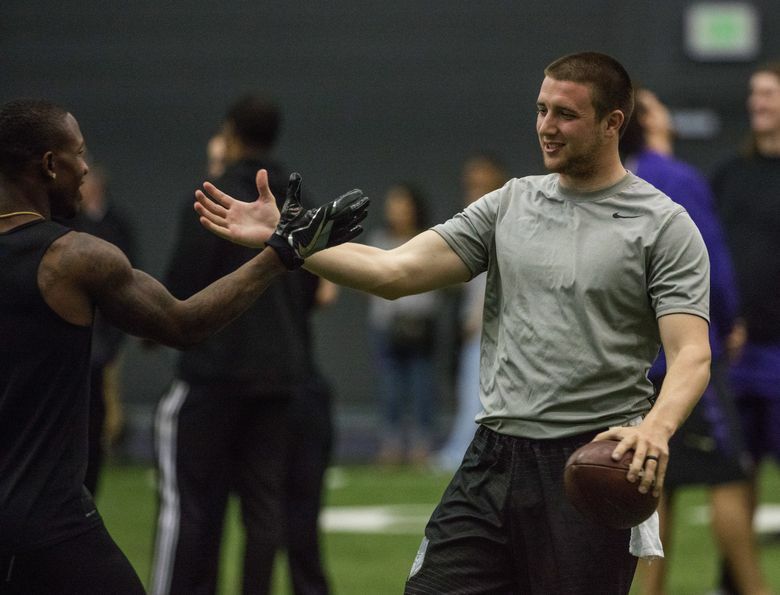 Snyder said the Pro Day performance was especially pivotal, saying afterward “several’’ NFL teams inquired about Heaps. Heaps had also recently signed with Edmonton of the Canadian Football League and took part in their mini-camp last month in Vero Beach, Fla. But he was recently released, with Snyder saying that the Eskimos knew Heaps’ preference was to take another shot at the NFL. “They were well aware that Jake still has an NFL run in him and that makes it difficult to plan around that,’’ Snyder said. Heaps becomes one of three QBs on Seattle’s roster after Russell Wilson and former TCU star Trevone Boykin, who signed as an undrafted free agent on Saturday. Former Oregon and Eastern Washington star Vernon Adams is also expected to attend the rookie mini-camp on a tryout basis. Adams is also reportedly attending a rookie mini-camp at Washington the following weekend. Seattle’s backup of the last three seasons, veteran Tarvaris Jackson, remains unsigned and is a free agent. Seahawks GM John Schneider said the team has been talking to Jackson’s agent, but so far no deal has been struck, leaving the Seahawks to explore other options. The Seahawks had earlier in the off-season signed free agent Philip Sims. But he was released last week leaving the Seahawks with just one quarterback — Wilson — as it entered the draft. Seattle now has three on its roster — Wilson, Boykin and Heaps — with Adams a possibility down the road depending on how things unfold this weekend. With the Seahawks, Heaps will join another Skyline High All-American, receiver Kasen Williams, who was a year behind Heaps in high school but teamed with Heaps for three seasons with the Spartans. Williams also signed with the Seahawks last spring as an undrafted free agent and ended up being active for the final two regular season games and both playoff games.